Schedule Dog Training!Schedule Dog Training! Looking for a dog behavior specialist for your out of control dog? No matter what your private dog training needs are, or how you prefer to train, we’ve got a solution for you. 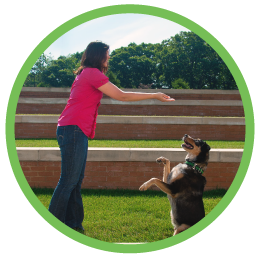 Are you hands on and would enjoy being coached through your dog’s training? Or does life have you swamped and you’d prefer we do the work for you? No matter, we’ve got you covered! Why is The Persuaded Pooch best private dog training for you? Why pay $150, $250 or even more to find out if a private trainer can help you? Our “meet and greet” for dogs 21 weeks and older is FREE! Training plans are customized for solving YOUR dog behavior problems. There’s no such thing as a “one size fits all” training plan for you and your dog. Trainer/Owner, Sarah Hoth, is certified and endorsed by world-renowned clicker training expert, Karen Pryor, and committed to upholding only the highest standards of positive puppy and dog obedience training. We have many years of experience working with shelter/rescue dogs, shy/fearful dogs, reactive/aggressive dogs, assistance dogs, therapy dogs and pet dogs in many different types of challenging situations and environments. Flexibility – Does your dog have a lot of issues, or just one? Do you want to learn in a real-world environment or prefer lessons at home? Either way, we have training options for you, plus training on evenings and weekends to fit your busy schedule. Professionalism is our specialty. You’ll receive prompt and courteous communication, on-time and prepared arrival and only the highest level of service. Plus, we are bonded and insured for your safety and peace of mind. Looking for group class? Click here! Looking for puppy training? Click here!